Almost local band (Sacramento) Cake just blew my mind Sunday night, the perfect way to end six craaaazy nights of Noise Pop. If you’ve ever been around me while I listen to Cake, you’ll realize that it was a genuine sacrifice for me not to sing and dance my little heart out to this one, in order to hold the video camera (mostly) steady. I usually manage to dance to Cake even if seated. 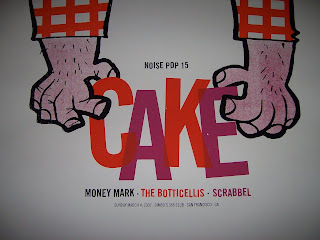 Cake plays with no setlist, freestylin’ along as they feel the urge (much to the chagrin of some pugilistic and determined audience members, who seemed to think Cake was a jukebox for requests until McCrea shouted several fire-eyed "f*ck you"s in their direction). We got songs from all the Cake albums, from the vastly underrated 'You Part The Waters' off Motorcade of Generosity, to 'Stickshifts and Safetybelts' (!!! ), 'The Distance' and the Willie Nelson cover 'Sad Songs and Waltzes' from Fashion Nugget, delightfully lots off Prolonging The Magic and Comfort Eagle (my 2 favorite albums) – 'Love You Madly,' 'Mexico' (in lamentably forgotten 3/4 time signature) the fantastic 'Shadow Stabbing,' 'Never There' . . . and a few from the newest one Pressure Chief ('Wheels'). They also threw in some non-album tunes like their cover of 'Excuse Me I Think I’ve Got A Heartache' by Buck Owens, and mentioned that they finally have a "new" release coming out (independent, now that they are free of the indomitable iron will of the major labels – “You’ll never see us on Conan again!” McCrea defiantly pronounced) called B-Sides and Rarities. It’ll be available shortly via cakemusic.com. You think perhaps that you are too cool to sing along at concerts? Not at Cake you aren’t, my friend. McCrea never fails to lead the crowd in several extremely passionate participatory tunes, including 'Sheep Go To Heaven' and, my favorite, the “Na na na na nana, Na na na na naaaaana”s of 'Short Skirt, Long Jacket.' He splits the audience down the middle, and pits us against one another in a savage fashion (it’s like Lord of the Flies, really), taunting us (“They’re f*cking LAUGHING at you!”) to whip the crowd to a fever pitch. I think I almost bust a blood vessel in my eye, and probably made up for six days of fitness slackery with all the gleeful pogoing and hip-shaking boogying I could muster. What an evening. If you’ve never seen Cake live, DO IT. Get as close to the front as you can, wear comfortable shoes (I ditched my knee-high boots behind a speaker after about 5 minutes) and prepare to have one of the best times you can legally have in the contiguous 48. 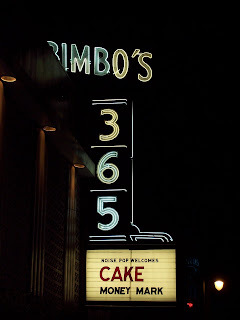 The show was held in fine closing-night soiree fashion at Bimbo’s 365 Club -- the classiest live music joint in the city, bar none. It’s a 1930s dinner club that retains all of its elegance and suavity from that era, even down to the grand piano, the wooden dancefloor, and the row of angled make-up tables and attendant in the ladies’ bathroom. The walls are draped with swags of glittery silver fabric, and until recently, they also had the real, live lady-mermaid swimming in a fishtank. McCrea commented on the missing mermaid, and it truly is a crying shame. Not enough ladies swimming in tanks in today’s modern nightlife, I say. Despite some keyboard malfunctions which prevented a successful rendition of his great new tune "Pick Up The Pieces" (which was co-authored with Jack Johnson), Money Mark pulled off a really good-spirited and varied set. He invited folks up on the stage to dance along and I almost, almost did. But the guy who actually did climb up and doggedly jogged in place, dropped for push-ups, and did jumping jacks far bested anything I could have come up with. There was also diminutive curly-haired Hispanic fella standing next to me in a leather bomber jacket, bobbing his head and taking in the show. About halfway through the set, Money Mark notices him and beckons him to join the band up on stage. 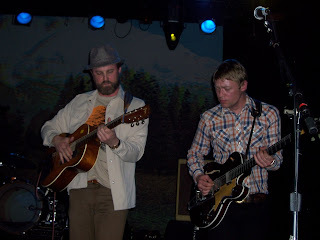 He climbs up, Money Mark hands him his sweet gold guitar, and dude jumps right in with the melody. 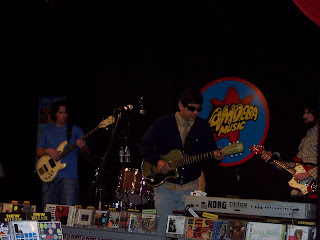 Turns out it was Tommy Guerrero, who has collaborated with all those guys on stuff like the Sprout surf film soundtrack. Tres cool. VIDEO: Money Mark, "Color Of Your Blues"
They’re calling boarding for my gate now as I type this in the airport, so I should go. I’ve never figured out why everyone is in such a rush to pack onto the plane as soon as boarding is announced -- I always wait until the last minute. Less time in the sardine can, the better. Bon voyage, San Francisco. Thank you for taking such good care of me and entertaining me in fine style. I think this was an absolutely peerless festival experience. I will definitely be back, because as Cake says (and I heartily second), as soon as you're born you start dying. So you might as well have a good time! Is being on Conan such a bad thing? I still remember them on for "The Distance". Was a great performance. i love this post. cake is a love i keep secret. hey, john wicks, drummer for Money Mark. mark's manager noticed your nice words and turned me on to 'em. Thanks sooo much for the blog space about the show. Despite the tech difficulties, we had a great time and appreciate such enthusiastic support. What's that wooden vibraty instrument that John McCrea plays on stage all the time? I love it! I remember seeing them at 328 Performance Hall in Nashville many years ago, and the crowd loudly sung along the whole time. 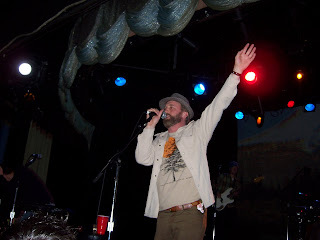 At one point in between songs, he said, "You're all so forceful with your singing." You know how it is...everyone in Nashville can sing. It was a great show! Cake is definitely a great band, although I'm disappointed they won't be doing my favorite late night show anymore. Chris the drummer from Scrabbel here. Thanks for the post. I would love to see the video footage. It appears to be dead. Anyway of uploading it again??? Thanks for stopping by. Try clicking the word "Rosamo" above the video, it just worked for me. Here is the direct link.